Cate Masters: What an exciting weekend! I'm still catching up from it. Normally I'm a homebody, but the weekend was jam-packed with amazing stuff. 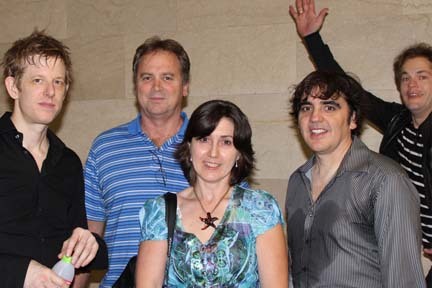 A few weeks before, I felt like I'd won the lottery when I got an email saying I'd won the Meet and Greet with the band! The email came on the same day as the phone call that I'd won first place in the Pearl S. Buck writing contest. I joked to my husband that I should run out and buy a lottery ticket to see if the streak would continue. So here's me and the hubby with (most of) the guys from Spoon! The next day, we traveled to Perkasie for the Pearl S. Buck awards. Afterwards, we stopped off at the Franklin Institute for the Cleopatra exhibit. One word sums it up: amazing. The artifacts didn't appear to have been buried undersea for centuries - some of the detail was just incredible, especially on the coins. And her jewelry... good thing they were enclosed in glass, lol. But some of the artifacts stood within reach (though heavily guarded). I wish I could share some photos, but they didn't allow any photography. 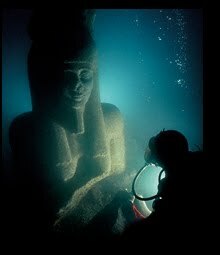 Here's an image from the web site, though - can you imagine coming across something so amazing beneath the sea? Awhile back, I'd started reading Margaret George's The Memoirs of Cleopatra but gave up because it was so long - more than 950 pages. But now I'm determined to go back and finish. I hope Spielberg or Cameron makes an epic film about Cleo soon. We haven't had a movie about her in awhile. She deserves the spotlight!